Having an opinion on anything, especially sports, means that sometimes you have to allow that opinion to shift. It also means that sometimes, you were perhaps more right than you thought you were. I find myself smack dab in the middle of these two seemingly opposing circumstances when it comes to two stories that are floating around the world of sports right now. I have previously expounded upon the career of LeBron James and the violent nature of the game of football in previous posts, and since those two topics are back in the spotlight right now, I thought I would take a two-headed approach to a bit of Bo Jackson’s Hip revisionist history. Not long ago, I wrote a post about how uncomfortable I am with being a football fan. I wrote about how my love of the game is clouded by the sheer destruction it can bring to those who play it, both in the short and long term. In that initial post, I talked about how the media firestorm surrounding head injuries was the impetus behind why I decided to vent on the violence of football, but that what truly unnerved me was the purely visceral feeling I continue to experience simply watching the game. That just taking in the action week after week during the football season had started to make me queasy. About how much of a mental strain it can be to take so much joy away from the game while at the same time knowing deep down that all of the collisions, limb twisting, and brutality of football are not good for those who play the game, and at the end of the day, for the viewer too. Well, I was right. And I was wrong. I still have all of the feelings that I expressed in that post, but have now integrated all of the head injury hoopla into my general feeling of unease. That’s because earlier this month, one of the most competitive and perhaps greatest linebackers the game has ever seen took his own life. Junior Seau’s suicide should not be called shocking in any way shape or form. Seau was previously involved in a car accident that sent his auto sailing off a cliff in Southern California, and while he insisted that it was just that, an accident, many speculated that it was an attempt on his own life. And with all of the information that continues to leak out of the story concerning Seau’s depressive mind state over the recent past and some erratic behavior over that same time frame, it is clear to this writer and many others that the number of blows Junior took to the head had to have had an affect on his mental stability and mood. This is accentuated by the manner in which Seau committed suicide. He shot himself in the chest, which already seems like an unusual path to the eternal on first glance, but upon further examination is another chilling reminder of the kind of continued controversy the NFL must deal with in regards to head injuries and their long term psychological and physical effects. Seau shot himself in the chest, preserving his head and the brain inside of it. The similarity to the way that Seau chose to take his own life and the way another former NFL player, Dave Duerson did so just last year is eerie and telling. Duerson’s suicide note, which is featured in the picture above, makes it clear that he knew where the demons haunting him originated. 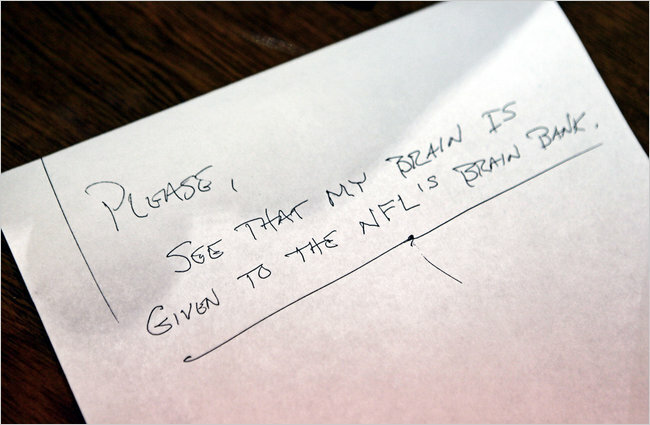 He pleads with friends, family, and the medical profession in that suicide note to study his brain postmortem, the only way to determine if he was suffering from chronic traumatic encephalopathy, a condition that more and more is the telltale sign of a life and personality permanently affected by a career in professional football. He was. Duerson’s blatant message from the great beyond was that despite what he may have thought earlier in his life, he knew at the time of his passing that football and the impacts his brain was exposed to week after week, year after year, were the reason he had reached suicidal levels of despair. It becomes that much easier for us to make the connection between his death and Seau’s because of the manner of their suicides and the increasing level of scrutiny and research the NFL is devoting to head injuries (at the behest of an increasingly concerned public and sports media). I was right, football is brutal, but I was wrong, head injuries should now become the focus of not only the press, the league, and physicians, but more importantly, players and fans like me. As I said, this post is meant to be a reexamination of opinion on two fronts, and the second, while not a matter of life and death, could be a matter of career life and death for LeBron James, the best basketball player on the planet earth. I wrote a post last June after James’ Miami Heat fell to the Dallas Mavericks in the 2011 NBA Finals examining what the hell was wrong, and what the hell was right with James and the Heat, and as with my musings on violence in football I feel that I got a lot of things right. But in the year since, I was also wrong about many aspects of James’ career arc at the same time. I said last June that LeBron needed to ditch the likable, nice-guy persona he built as an insouciant youngster in Cleveland, where he was a teammate’s dream and a bundle of energy and excitement on the court. I thought that the way he and the Heat played in the 2011 Finals--reluctant, ill at ease, unnecessarily unnerved--was a manifestation of James’ unwillingness to embrace his new role as sporting villain and his inability to develop a killer edge. I thought that if James could pair his inarguable talent and athletic acumen with the killer instinct that resides in so many of the greatest players in any sport, he would be unstoppable. I thought that if he didn’t do this, he was destined to be known as the ultimate front-runner in the world of sports, which does not usually a legend make. But then he put on an MVP performance this regular season that showed just how amazing a basketball talent he is. There isn’t a player in the league that filled out the stat sheet like James did this year, and I thought that maybe I was wrong. Maybe he could remain true to his playful self and succeed at the same time, and I found this especially true considering the Heat were 15-1 while James’ near equal in talent, Dwyane Wade, was sidelined with injury. To further my appetite for crow, Sports Illustrated did a cover story on James in the final week of April that had me completely convinced of the error of my ways. James professed a basketball rebirth, where he stopped thinking so much about his play and returned to an unabashed excitement for the court and enjoyment level that he hadn’t felt since coming to the Heat. His attitude was back to where he wanted it to be, and his play was simultaneously flourishing in South Beach. I thought that I was dead wrong and that James could be a sports world exception, a Brett Favre of the hardwood who never hid his childlike enthusiasm and still succeeded. But what I forgot was that the SI cover story, and the story of James’ alleged personal reclamation of his attitude, were based on a regular season performance. I forgot that we were not, unfortunately, talking about the playoffs. Shout out to the homie Jim Mora. Thus far in the playoffs, James seems up to his old tricks. And while I was ready to take back all the doubts I had about his ability to play nice and play well, he is already reminding me of why I thought what I thought. 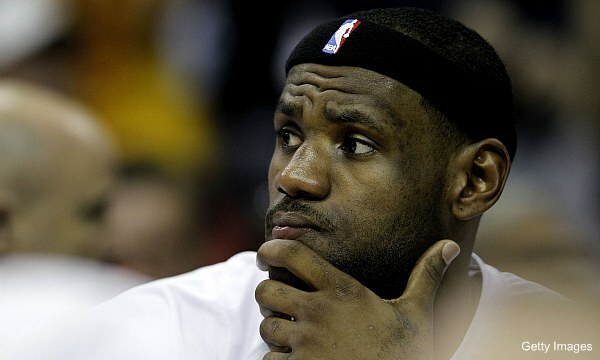 For all of the enjoyment that LBJ claims he has regained, it is not evident on the court, where he still looks listless. Nor is the solution offered up by yours truly, a killer instinct. If James would truly like to win more like Brett Favre than Tiger Woods, or to stay on the court, more like Michael Jordan, he needs to do just that. The most important part of that sentiment being the word “WIN”. Against the Indiana Pacers in game two, James again missed key free throws in the closing moments, and was joined by Wade in having a severe case of the charity stripe yips. With the game on the line and a last shot that could have tied the game, the action didn’t even run through James and the Heat settled on a shot by Mario Chalmers. Chalmers is a fine basketball player, but in order to be what he wants to be, it must be James taking that final shot, or at the very least James passing out of a double team to an open Chalmers or Wade. So again, I was right, then wrong, and now I feel right again about LeBron and his ability to win. I know, we’re only in the second round of the playoffs and the Miami Heat are without the third part of their multi-million dollar trifecta Chris Bosh due to injury, but that will be no excuse if once again the Heat come up short. I tweeted earlier this regular season that it amazes me that with the amount of talent, scoring ability, and defensive tenacity that the Heat possess, they consistently look beatable, night after night. That has to change and change quickly if they hope to escape the Eastern Conference Playoffs, where despite a manly 40 point 18 rebound performance from James in game 4, they are struggling with the Indiana Pacers in round two. James needs a lot more of those nights, especially when the pressure is on, and more help from Wade if the Heat want to make a run to the Finals and an NBA Championship. It may take a decade, maybe even two before I finally know how right or wrong I am about the devastation that emanates from football and the legacy of LeBron James, but until then I am floating somewhere in the ether on both counts. Right or wrong, I will be as interested as you as to how things eventually play out.